Homemade herbal gifts are gifts from the heart. Unique and one of a kind, they make memories long after the herbs themselves have faded. Herbal gifts change with the seasons, the creator using what is available and bountiful during each month. 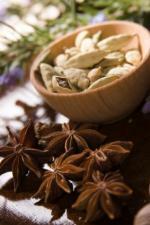 From edible items to cosmetics, and wreaths to potpourri, herbs make welcome gifts in every circumstance. A gift of flavored vinegar or honey tucked into a small basket with some herbal tea is a special touch. Homemade, herbal gifts are a thoughtful way to say everything from "Welcome" to "Get well, soon." In a half pint mason jar place a fresh leaf of washed rose geranium, mint, rose petals, lavender sprig or other edible herb. Warm the honey and pour it carefully over the herbs and put a cap on the jar. Allow to stand a day or two so that the honey is permeated with the herbal flavor. Decorate the jar by covering the top with calico, or stenciling the jar itself. Use raffia to tie a vintage silver spoon to the jar for dipping the flavored honey into tea. Mix flour, baking powder, and salt and add to the creamed mixture. To present this gift, roll them in clear plastic and tie at both ends with a sage green, pink, or purple ribbon. 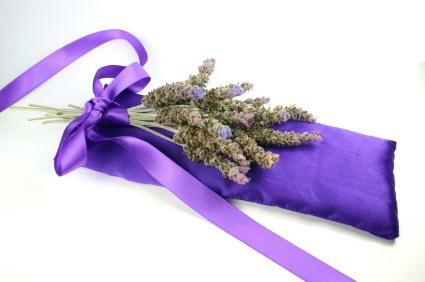 Tie a fresh sprig of lavender in the bow of the ribbon. On the short ends of the calico fold over one-half inch and press it. Now, fold over one half inch again and press so that the raw edge is encased. Fold the piece into thirds, with the folded ends facing out, and with the left side overlapping the right by the width of the fold. It should overlap at the center of the piece. Sew a half inch seam along each side. Trim corners on a diagonal, turn right side out, and press. Topstitch all around the fabric. To make the pouch for the spices, make half inch folds on each short side of the muslin and press them. Fold the fabric in half at the center and press. Sew up both sides, and turn right side out. Insert one cup of the spice mixture into the muslin pouch and stitch closed. By using a smaller piece of cloth you can also make mug mats. When hot dishes are set on these it releases a cozy, spicy scent. Mix together with the spice mixture. Allow to stand, covered and in a dark place, for one month before using. These were used to relieve headaches in Victorian times. Homemade, herbal gifts like these were once treasured keepsakes. They are regaining popularity today, and will fill a room with a sweet scent. Cut a 24 by 18 inch rectangle out of calico or other cotton fabric. Fold in half lengthwise with the wrong side out, and press. Sew a three-quarter inch seam across the short end and up the long side. Leave one end open for filling and turn right side out. Fill the pillow loosely with lavender, hops, and lemon verbena. Turn in the remaining raw edge and slip stitch closed. Tie a coordinating, silk ribbon around the center to draw it in slightly in an hourglass shape. Make small muslin bags and fill with this fragrant potpourri to hang in closets and place with stored clothing. There are hundreds of other items that make great herbal gifts. 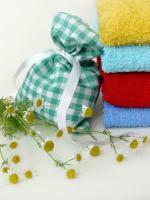 Herbal bath bags are a welcome gift for a stressed out friend, new mom, or someone you know who likes luxurious baths. Homemade herbal teas, mulling spices and gift baskets are welcome gifts for almost anyone. It's a good idea, especially during the holidays, to have a few items on hand for impromptu gift giving. Using herbal products to make gifts is a wonderful way to feed your creative muse while showing someone just how much you care. A homemade gift is usually one that will be remembered fondly long after the gift itself is gone.